United Safety’s Air TreQ™ Blinder was recently featured in HSE Now, the online HSE magazine from SPE. The article discusses the frequent turnaround bottleneck of short-duration jobs requiring breathing air, such as blinding. 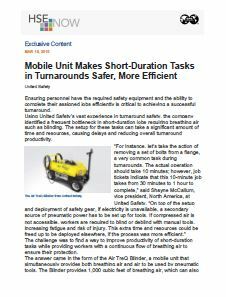 The setup for these tasks can take a significant amount of time and resources, causing delays and reducing overall turnaround productivity. United Safety’s answer to this challenge was the Air TreQ™ Blinder, a mobile unit that simultaneously provides both breathing air and air to be used by pneumatic tools.